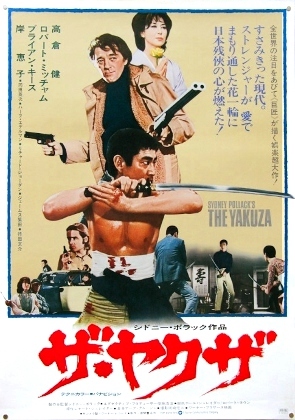 "East-meets-West" films didn't begin with Sydney Pollack's The Yakuza (1974); hits like Enter the Dragon (also released by Warner the previous year), not to mention Spaghetti Westerns such as Red Sun (1971) and The Silent Stranger (1968), had already carved out a slice of film history. 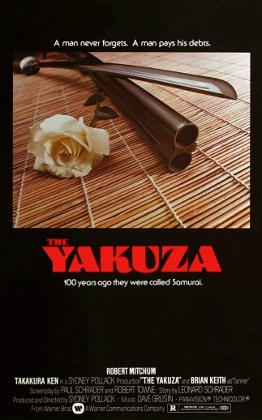 Yet The Yakuza is one of the first to fully commit to one side: it was shot almost entirely in Japan, made use of a largely foreign crew, and used traditional Japanese filming techniques, while introducing audiences to history and lore they were likely unfamiliar with. Another claim to fame is the script: it was originally written by newcomers Leonard and Paul Schrader, who were paid a record sum of $325,000; soon enough, Paul went on to partner with Martin Scorsese on future classics Taxi Driver and Raging Bull, while older brother Leonard wrote scripts for films like the Oscar-nominated Kiss of the Spider Woman (they even worked together again on several occasions, including that same year's Mishima: A Life in Four Chapters). But it didn't matter at the time: The Yakuza struck out with critics and audiences alike, many of whom weren't keen to its foreign locales, cultural exposition, and/or bursts of graphic violence. Yet Pollack's film has aged fairly well---or at least kept its head above water---for many of those same reasons, especially since international film and cultural exposure are obviously more common now than four decades ago. It doesn't hurt, of course, that Pollack's skillful direction keeps The Yakuza flowing smoothly, while the terrific lead and supporting performances by the likes of Robert Mitchum (Out of the Past, Cape Fear), Ken Takakura (Black Rain), Eiji Okada (Hiroshima mon amour), and Keiko Kishi (Kwaidan) hold up as career highlights...or at least interesting diversions. 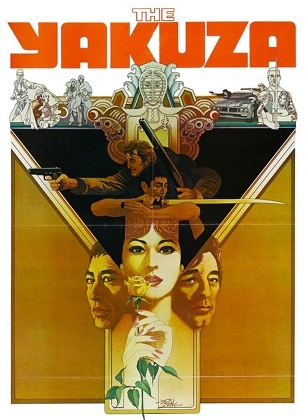 Our story follows retired detective Harry Kilmer (Mitchum) during an impromptu trip to Japan when the daughter of his old friend George Tanner (Brian Keith, The Wind and the Lion) is kidnapped by yakuza gangster Tono (Okada); along for the ride is Tanner's bodyguard Dusty (Richard Jordan, The Hunt for Red October). This isn't the first time Kilmer's been to Japan, having served during the post-WWII occupation and developed several connections there over the years. One of them is Oliver Wheat (Herb Edelman, The Odd Couple), who they stay with; another is a woman named Eiko (Kishi), who Kilmer has been involved with professionally and personally. Their reunion is short-lived, however: Kilmer's looking for her brother Ken (Takakura), whose close ties to the yakuza---and debt to Kilmer for saving his sister's life in the past---make him the best ally for saving Tanner's daughter. Though saddled with such an imposing setup, The Yakuza does a fine job of keeping things in order as the plot unfolds. Suspense builds naturally and, along the way, a few violent encounters with yakuza members absolutely crackle with energy and excitement. Meanwhile, the backdrop of 1970s Japan offers a rich mixture of neon-lit urban development and a more old-fashioned way of life, as the country in transition perfectly mirrors the clash of cultures represented in the story itself. But The Yakuza is as much about acceptance---or at least tolerance---of foreign customs and ways of life, which results in a good amount of that cultural exposition mentioned earlier. One lengthy dialogue scene, shot at the stunning Kyoto International Conference Hall (also seen during the climax of John Frankenheimer's The Challenge), is even lamented by the late Pollack himself in a 2007 audio commentary. Yet most of The Yakuza holds up extremely well and will satisfy those looking for something a little different: divided neatly between neo-noir, drama, and action, it's hard to deny the sheer entertainment factor of a film willing to take so many risks. Warner Bros.' new "Archive Collection" Blu-ray gives The Yakuza a well-earned second life on home video, easily beating their own 2007 DVD with a nicely improved A/V presentation and the same small but valuable collection of bonus features (including the mentioned Pollack commentary). It's admirable treatment for a memorable film that's earned a growing fan base during the last four decades, and just one more solid production from a late director with no shortage of highlights on his résumé. I've been very impressed with just about every Warner Bros. Archive Collection Blu-ray that's crossed my path, and The Yakuza is no exception. Presented in its original 2.35:1 aspect ratio, this 1080p transfer (presented, as usual, on a dual-layered disc with a high bitrate) represents a solid upgrade from the studio's own 2007 DVD in every department. Image detail and textures are definitely improved, and many of the low-lit scenes fare much better this time around with more clearly defined levels of shadow detail and contrast; those with a soft spot for 1970s cinema will be glad to know that The Yakuza clearly looks like a product of its time, and for all the right reasons. Its color palette shows improvement as well, and the occasional bursts of bright crimson blood have never looked less authentic. Dirt and debris are basically absent, and no digital manipulation (noise reduction, compression artifacts) was detected either. It's fantastic treatment of a deserving film, and die-hard fans will be extremely pleased. The Yakuza's audio is presented in its original DTS-HD Master Audio 2.0 format (split mono) and sounds more crisp and refined than the DVD. Not surprisingly, Dave Grusin's score also benefits greatly from the lossless boost, allowing for several moments of modest depth and a solid dynamic range overall. Low frequency effects are virtually absent, but there's no obvious clipping or distortion in the high end. Two sets of optional subtitles are included during the film: one translates only the Japanese dialogue, and another (written in ALL CAPS for whatever reason) is more of a traditional SDH captions track for the deaf and hearing impaired. The static interface is clean, simple, and easy to navigate, with a stylish black-and-red background image that's based on a vintage poster design (not pictured). This one-disc release arrives in a standard blue keepcase with poster-themed artwork---much like the one seen below center) and no inserts of any kind. As usual, a basic but professional-looking presentation. All three supplements from Warner's 2007 DVD have been ported over to this Blu-ray, including an Audio Commentary with director Sydney Pollack, a vintage "Promises to Keep" behind-the-scenes featurette, and the film's dramatic Theatrical Trailer. It's a great little trio of bonus features that I'm glad were kept, especially considering Pollack's death in 2008. The featurette offers a decent blend of on-set footage and Japanese landmarks, with the director's commentary going into more detail about the shooting, culture/history, casting, and action choreography, although there are a few stretches of silence along the way. The Yakuza was several years ahead of its time, unique in its committed East-meets-West attitude and written with an adult audience in mind; this is anything but a non-stop action extravaganza, which makes the occasional bursts of violence even more potent and effective. There are several moments of cultural exposition that date the film and may slow down repeat viewings, but The Yakuza is so memorable overall that it's an easy one to revisit in the right mood. Featuring great performances, a terrific atmosphere, and no shortage of twists and turns along the way, this engaging drama should easily impress first-time viewers. Warner Bros.' new Archive Collection Blu-ray easily beats their DVD from a decade ago, serving up a suitably improved A/V presentation and the same collection of small but important bonus features. Highly Recommended for old fans and newcomers alike.